Protect Your Investment:“One Size does NOT Fit All”- Size First, Buy Second! A purchase of a new bike is an investment that is best done with guidance from experts advising you on components, accessories, features and benefits. However, if your new bike doesn’t fit you won’t enjoy it and then it instantly becomes a bad investment. How do you know if your bike is a good fit? The focus should be on what you don’tfeel rather than what you dofeel. When riding you should not be thinking about your position and how to alleviate discomfort, you should be able to completely enjoy the ride and feel great for the entirety of it. With a great bike fit this can be achieved. If you find yourself frequently shifting around and squirming to find a more comfortable position when riding you are less focused on the enjoyment of the experience and constantly distracted. Next time you get off your bike check in with your body. Is your neck sore, are your shoulders tight, is your back sore or your sacro-iliac joint locked? The answer should be no to all the above. If it is yes, then it’s time to experiment with your bike fit. Riding with comfort also means you can still ride fast. The constant evolution of aero bike designs with the addition of components and accessories like carbon wheels and aero helmets can create an ideal aerodynamic masterpiece that is fast and sleek. However, we need to remind the client that they themselves are the biggest factor when looking at aerodynamics. You should be able to hold your desired aero position for more than 10 minutes. Your most aero position is sustainable for many hours, this is the key and one we aim to master with a custom fit. 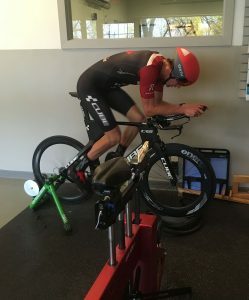 Pro Triathlete Jason Pohl, a customer and Calgarian, discusses in his blog his experience with bike fitting, the importance of it and how he experimented to find his optimal fit. Please read on to see his blog.